I bought half a cow (hide) last week. Many years ago we went to visit my Mother and she was proud to tell us she had bought half a cow. Of course, that was too much for my brother and me. We immediately started to quiz her on which half of the cow she bought. She could have bought the front half, the rear half, the top half, the bottom half, the left half, the right half; I could go on and on. (I guess you had to be there.) What she had done of course, was to go in halves with someone in town and have a cow butchered and wrapped for the freezer. What brings up this nerd review is the Roorkee Chair from Chris Schwarz’ s “Campaign Furniture” which I have begun to build as part of my back-to-the-shop fall season. I needed a couple of fairly large pieces of leather to make the back and the seat of the chair, so I went to my local Tandy Leather Company to buy what I needed. I’m still learning this leather business, so the very helpful people at the store jumped all over it when I took the book with me and opened it on the counter. It seems that leather comes in different thicknesses and is labeled by weight, as in “3 to 4 oz” or “7 to 8 oz”. One ounce equals 1/64” of thickness so 7 oz equals 7/64” of thickness. The thickness of the hide varies, so the weights are given in a range. Being a natural product, leather will stretch with use, so particularly for a chair seat, 7 to 8 oz is required. Based on recommendations in the book, I needed a side of leather which should give me enough for two chairs. I like the “veg-tan” finish which is a lovely light natural color. The store offers all kinds of dye to make it any color you like, but I thought it only right to make mine British Tan. 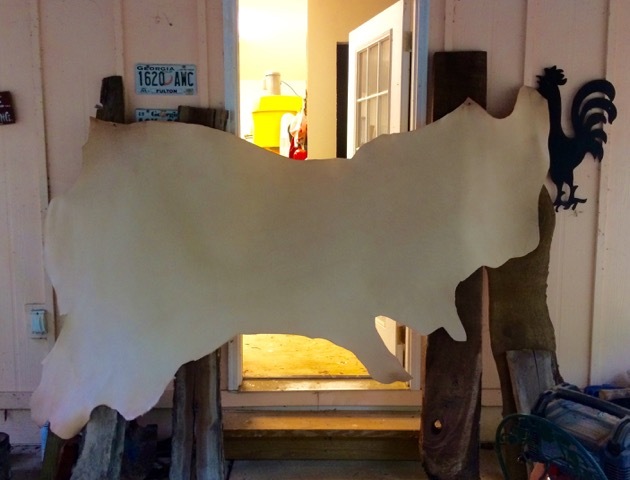 The clerk showed me a side of leather which was beautiful and on sale, so I bought a half a cow. It was a big cow. It was a real big cow (actually, a steer, I suppose) so I rolled it out and tacked it up on the side of the shop to get a feel for it. It must weigh 20 to 30 pounds. You can actually see the rear leg on the left, the front leg and the neck. Hard to see in the picture, but the ownership brand is visible on the top left at the hip. I was a little creeped out by the whole thing truth be told. I mean this was a living creature not that long ago and obviously a magnificent one. I have the tiniest bit of appreciation for the pre-history tradition of apologizing for taking the animal. Woodworkers ask how do you cut the stuff? A utility razor knife works very well – it is just skin. Chris recommends making a hardboard pattern and using it for a guide. The biggest thing is to keep the cuts vertical. Once it is put together, you can still trim the edges to square them up. 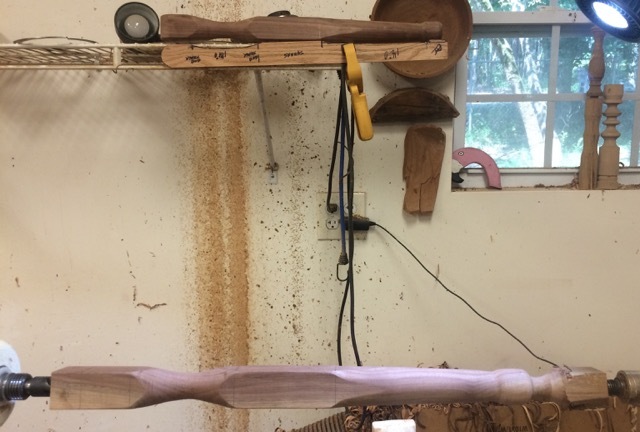 I have two of the four wooden legs turned to final shape. Next I plan to make the patterns out of some thin plywood to cut out the leather portions and then keep working on the Roorkee. Who knows, they might need me soon on a campaign in India. Patterns above, leg on the lathe.